My last new bike was a ATIME RXR back in 2008, and before that was a LOOK 595 Ultra. I still own both and love them for different reasons. As close as I tried, both of those bikes also fit me slightly differently with their pro/cons to each. They both feel and behave very differently. For the past 2+ years, I have been looking to get a new bike, but frankly nothing new in the market seemed to have any real and huge advantages to either bike I already had. 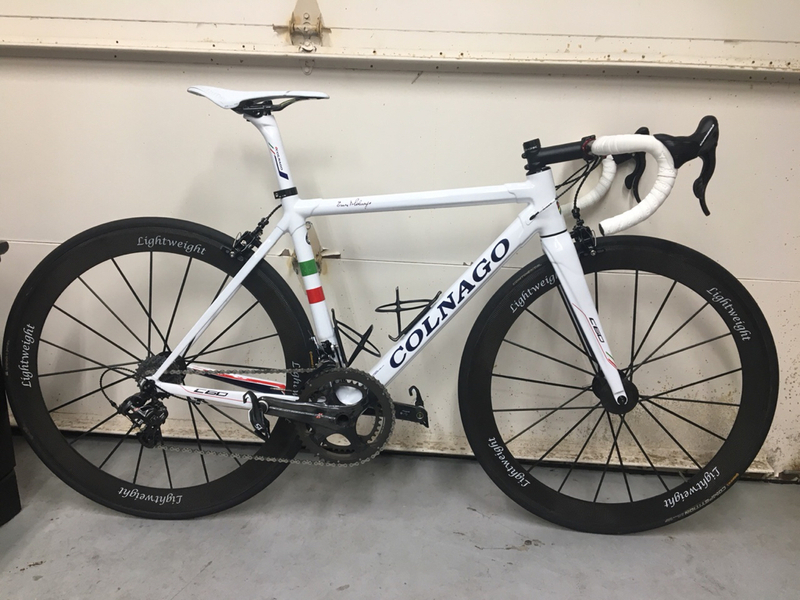 I consider the Parlee Z3 and Z5, the new LOOK 795, and the Colnago C-60. The Parlee, while could be built into a true weight weenie bike, had nothing "stellar" to offer than 6-8 other bikes in the market didn't have. The LOOK, while exotic and different, had too many proprietary parts for my taste. 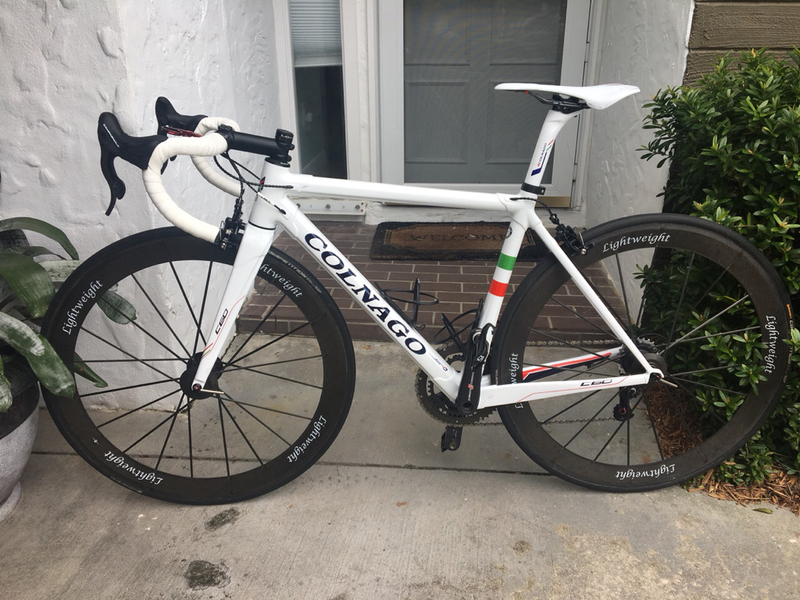 The Colnago seemed like that "safe choice" the everyone raved about as refined, slightly heavy by comparison, and yet superior to most (at least by opinion). PS: Yes, my kids make me name all my bikes, skateboards, cars, and anything that moves really. Last edited by dgasmd on Mon Jan 29, 2018 3:51 am, edited 1 time in total. Looks great. My only gripe would be the bottle cages, but that is being nit-picky. Enjoy the ride! Weight with my crappy scale came to 14.03 Lb. I have a Park Tools scale coming in the mail, so will verify with it. I really wanted to stay under 14Lb as a meaningless goal, which is still achievable with a simply seat and seat post swap if I really wanted to. See notes below. This is my first full build ever. I have done, do, and can do pretty much everything on bikes. I do all my maintenance and repairs on my other bikes too, but have never done a full on build. That came with many questions I had to figure out by trial and error and using the help of others, forums, and many Youtube videos. This was a bit bothersome at time because a lot of simple questions had no pictures of video to verify against. Especially while using my choices of components and parts vs what came with it. In the end, it was far easier than I anticipated. Surprisingly enough, this bike fits me much better than my other 2. The differences are minute in terms of measurements, but enough to be noticed the moment I sat on it. The head tube is lower and shorter than even the LOOK 595, which was welcomed as it gives me more aggressive drop from saddle to bars (unfortunately I can't make my legs grow to achieve that). I am still flexible enough at my age to handle it, so I will enjoy it while it lasts. Still need to do some minor tweaking to the bar positions, the lever position, and the saddle position. I will cut the rest of the steer tube above the stem after I tweet things a little. I write this with only one ride under my belt on it. The only negative things I noticed within 15-20 miles was that my taint had a lot of pain and numbness. I have been using the same saddle (**) for close to 10 years now without such issues at all in my other bikes. I know Selle Italia changed the shape of the saddle a bit 3-4 years ago, so it may be the reason. I tried changing the angle a bit on it from flat to slightly up on the tip as I kept sliding forward, but no difference in results. I will play with it a bit before deciding what to do with it ultimately. The second thing is that the cage in the seat tube sits so low that when a bottles gets put on it, the bottom rests on the down tube and not on the tab of the bottom of the cage. Not a major issue really since I usually just put a cut bottle there with a spare tubular and CO2 stuff. The cage does accommodate every single one of the 6 different types I tried. Comes in and out easily without being loose and having fear to loose it. The angle/action to go in and out is different than the mandibles I am used to, so in time I will get used to it I guess. Don't have to do weight lifting 3x/week anymore to be able to get the bottle in/out as I did with the mandibles. I am a true Campagnolo user. Have been since back in the very late 80's. -Campagnolo Super Record Mechanical with Ti in crankset, Record chain, and Chorus cassette 12-25. Wile there was nothing earth shattering or super spectacular in comparison, the differences to both of my other bikes using same wheels/contact points was definitely noticeable. Soft and refined, don't feel every bump on the road as harsh, much more comfortable and "efficient" climbing out of the saddle and more so while sitting, and somehow even the pedaling felt more efficient. There is not a single place where I can say this bike wobbles or needs stiffening. I can only guess descending has to feel like it is on rails. More on all this as the miles come on and the trips on it begin!! Very nice. White is good. What about them in particular? Also, didn't you post this already? Nope. I did post a blur of it and a picture in my other thread about all the bikes together, but never included details about. dgasmd wrote: What about them in particular? I'm no fit expert so feel free to take this with a grain of salt, but since you have more drop and are falling forward, perhaps the problem is that you are sitting further forward on this bike than before on your other bikes. It's not that you are falling forward, more that your pedaling pulls you forward on the seat because you are leaning forward. So I wonder if you need to move your seat forward to match where you are now naturally moving to? So rather than trying to stop the slide forward (by angling your saddle back), instead have your seat where you naturally end up anyways. And maybe actually drop the nose of your saddle a little too, to match your more forward lean? Sorry if this is not helpful. Ridiculously nice ride. Flawless build. My only comment is lever positioning. I would slide the levers up the bar about 1/2". I prefer the lever pocket level with the plane of the bar top. You could then roll the bar forward slightly for flatter drops matching the hand position you have now. Food for thought. You're no beginner. Comments don't go unnoticed. Turns out the seat tip to bar center is slightly shorter by a few mm than my Time bike and about the same as the LOOK. However, lower than both. You may have a point here regardless. I will have to play with the fit altogether, but thanks for the suggestions. I would slide the levers up the bar about 1/2". I prefer the lever pocket level with the plane of the bar top. You could then roll the bar forward slightly for flatter drops matching the hand position you have now. You are on the money. I built the bike up and put everything where it is at now by simply eyeballing it. Your suggestions are exactly what I am doing to it right now before the next ride. It pains me to agree with someone that has a GT mascot as their avatar, but not a fan of the bottle cages either. by JScycle » Sun Aug 19, 2018 12:23 pm » in Introduce Yourself / Gallery - Please use metric weights.